"The catbird seat" is an American English idiomatic phrase used to describe an enviable position, often in terms of having the upper hand or greater advantage in any type of dealing among parties. According to the Oxford English Dictionary, the first recorded usage occurred in a 1942 humorous short story by James Thurber titled "The Catbird Seat," which features a character, Mrs. Barrows, who likes to use the phrase. Another character, Joey Hart, explains that Mrs. Barrows must have picked up the expression from Red Barber, the baseball broadcaster, and that to Barber "sitting in the catbird seat" meant "'sitting pretty,' like a batter with three balls and no strikes on him." The phrase "In the catbird seat" was among the numerous folksy expressions used by Barber. According to Barber's daughter, after her father read Thurber's story, he began using the phrase "in the catbird seat." This seems to reverse events, however, as the passage of story quoted above clearly references Barber himself. According to "Colonel" Bob Edwards's book Fridays with Red, Barber claimed that Thurber got this and many other expressions from him, and that Barber had first heard the term used during a poker game in Cincinnati during the Great Depression. Barber himself also put forth this version of events in his 1968 autobiography, Rhubarb in the Catbird Seat. Further usage can be found in P. G. Wodehouse's 1958 novel Cocktail Time: "I get you. If we swing it, we'll be sitting pretty, 'In the catbird seat.'" 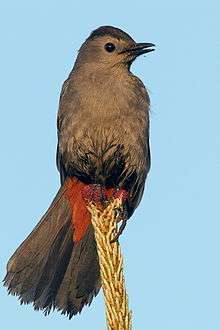 According to Douglas Harper's Online Etymological Dictionary, the phrase refers to the gray catbird and was used in the 19th century in the American South. Ken Harrelson, the play-by-play TV broadcaster for the Chicago White Sox, has been often heard referencing "the catbird seat" during games. Indianapolis sports radio hosts Query and Schultz, of 1260 WNDE, frequently use the phrase to describe teams in an enviable position. It is also often used by various NASCAR broadcasters to refer to a driver in a pivotal, valuable position, such as the leader, the last driver to be guaranteed into an event, or a driver utilizing a risky strategy that may bring them to victory. When used in the sense of a lookout, it can be considered a euphemism for the nautical term "crow's nest" that is used on sailing ships. The title of the penultimate episode of the Deadwood television series is "The Catbird Seat". John Kasich used the term on February 25, 2016 debate to describe Russia's position in Syria. A Nashville, TN, restaurant is named The Catbird Seat. The term 'Catbird Seat' is mentioned a number of times during the Manhattan Season 1 TV series to indicate that forbidden dialogue has occurred between scientists working on the A-bomb project at the end of the 2nd World War, who should have been isolated from each other through compartmentalisation (scientists working on inter-related problems without the knowledge of others). ↑ OED.com, Oxford English Dictionary. Accessed 23 October 2008. ↑ Edwards, Bob. (1993). Fridays with Red: A Radio Friendship. New York: Simon & Schuster. ISBN 0-671-87013-0. ↑ Barber, Red, and Robert Creamer. (1968). Rhubarb in the Catbird Seat. New York: Doubleday. ISBN 0-8032-6136-5. ↑ Catbird, Online Etymological Dictionary, Douglas Harper. Accessed 17 September 2006. ↑ in the film "Raising Arizona" John Goodman says to his partner "we will be in the fabled catbird seat"